1) Our beautiful custom rings are each hand made to order. Each ring will be unique and like no other ring. Due to their Custom nature, we ask for payment before we start a custom ring order. Certified matching sets made from the same meteorite are available at a small premium. If you are interested in this unique option please ask when placing your order. 2)	Due to the custom nature, cost and time involved in making our custom rings, we have a No Return policy on our Custom-made rings. All prices are subject to change and prices have been on the rise. To avoid future price increases we recommend placing your ring order sooner than later. Arizona Residents are responsible for paying sales tax. Please let us know if we will be shipping to Arizona when placing your order. INTERNATIONAL BUYERS ARE RESPONSIBLE FOR ANY DUTIES, TARIFFS, TAXES OR FEES COLLECTED BY THEIR GOVERNMENT ON IMPORTED ITEMS..
3)	In general Meteorite Rings can not be resized, though we may occasionally be able to loosen them a little. Because there are variations in the ring sizers used by different Jewelers it is very important to follow our sizing instructions below to ensure that you order the correct size. You are responsible for ordering the correct size. 4)	The best way to make sure your order the correct size is to start by getting an estimated size at a Jeweler's using a ring sizer of a similar width to the ring that you plan on ordering. Don't get sized using a 2mm wide sizer if you plan on ordering a 6mm wide band. Do this during the middle of the day, when your hands are at their normal operating temperature. Cold fingers are much smaller than warm fingers. This step is very important to insure you receive the correct sizing kit! 5)	Then email us at: meteorite-rings@protonmail.com and give us your estimated size. Be sure to mention if you live outside of the US. Once we have received your ring order, we will mail you via Priority Mail a trial ring sizing kit containing your size, as well as a half size larger and a half size smaller. For US residents we charge a nominal fee of $21.50, ($14.70 of which is refundable after you return the sizers to us). For International Customers, with Priority shipping, the sizing kit is $39.95 ($6.00 of which will be refunded when you return the sizers to us). Be sure you include your name, email address and paypal address (for the refund) when you return your sizers.We generally process ring sizer refunds en masse about once a month. Please note that our ring sizing kit are exclusively for the use of our customers. 6)	Wear the trial ring that best fits you for several days. If you are not used to wearing a ring, you will notice that the ring feels tighter and looser during different times of the day. Determine the size that is the best fit for you. 7)	Once you have determined the correct size ring for yourself, send back the ring sizing kit and contact us to order your custom ring. We will make your ring the same size as the ring sizer that you have chosen. 8)	In the highly unlikely event that we make a size significantly different from what you ordered we will, at no extra charge, either correct it or replace at our option. If you order the wrong size and want us to make another ring for you there will be a 75% remake fee after we have received the first ring back in its original new condition. Please note that there are NO Refunds if you order the wrong size so please follow the above procedure to determine the correct size for you. It is the customer's responsibility to review the invoice for their order to ensure that everything is correct on it BEFORE paying. 9)	Please don't wait until the last minute to place your order. Custom rings can take 4 to 9+ weeks to complete depending on the style and our backlog. When placing your order be sure to tell us when the ring is needed. Rush orders may sometimes be possible depending on our schedule, however they cost more. Contact us for an estimate of our current turnaround time and to see whether a RUSH order is possible. We also have a number of rings in stock and ready to ship. If you need a ring right away please ask about this option. 10)	The meteorites used in all of our meteorite rings contain nickel and iron. If you are allergic to either of these metals or any of the other materials used in any of our rings please do not order a ring. 11) Things to consider when placing your order. If it is within your budget, we recommend getting a ring that has a lining on the inside. If you order a very narrow ring, you will have very little of the beautiful meteorite pattern to view. For this reason we typically don't make rings narrower than 4mm in width although we can make exceptions. The wider the ring the better the view of the meteorite pattern. For domed rings, narrower rings will have a more pronounced dome than wider rings and of course wider rings will have a less pronounced dome than narrower rings. In general the appearance of the proportions of a ring will vary with the size and the width of the ring. So, if you like the looks of a ring on our website that is a size 6 x 6mm width and you are a size 13, you will want to order a wider ring to keep similar proportions. If you are planning on losing weight for your wedding, this may change your ring size. If you are unclear on any of these details feel free to ask us. 12)	Our custom rings are quite durable. That being said, if you want your ring to stay looking nice you should care for your ring as you would any fine jewelry. Some common sense will go a long way in this regard. Don't wear your jewelry while doing yard work, construction work, automotive work, or similar activities or while handling abrasive or corrosive materials. Don't abuse your jewelry, or hit it against hard objects that could dent or scratch it. The Gibeon and Seymchan meteorites tend to be naturally rust-resistant, so while hand washing is, in our experience, not a problem, we do not recommend exposing your meteorite jewelry to excessive moisture. As with any fine jewelry, our rings should not be exposed to chlorine, bleach, chlorides, house hold cleansers or acids (your hands probably shouldn't either). Don't wear your jewelry in salt water, the hot tub or swimming pool. We have noticed that some hand lotions can cause staining of our finger so we avoid wearing hand lotions with meteorite rings. In cold weather or if you go swimming, your finger can shrink quite a bit causing your ring to fall off, so don't go swimming with your jewelry. 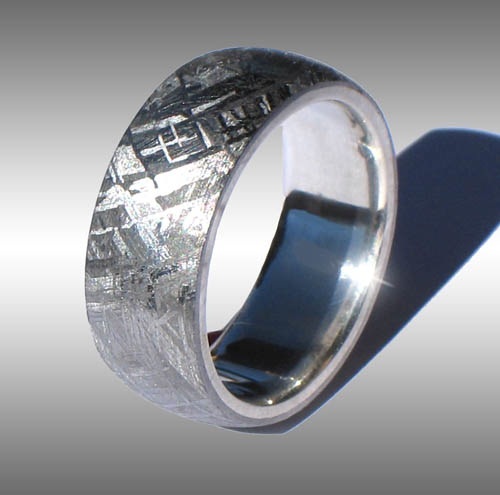 After a number of years, the etched pattern of your meteorite ring may be less sharp. If this occurs, the ring can be re-etched. 13) Please do not try to “polish” the Widmanstatten pattern on your ring. Meteorite rings can be cleaned using baking soda and a tooth brush. From time to time your ring may need re-etching. Please contact us to arrange for this. If you need any work done on your ring please contact us. DO NOT allow anyone other than us to work on your ring as most jewelers are not familiar working with meteorite and may cause serious damage to your ring. We will NOT be responsible for damage caused by others. 14) Your order will only be shipped to your paypal address of record. It is the buyers responsibility to make sure that their paypal address of record is up to date and is the correct shipping address before placing an order. WARNING: Like several other types of jewelry, meteorite rings contain iron, which is naturally attracted to magnets. So to prevent your ring from being pulled or yanked do not wear your jewelry near strong magnetic fields such as MRI machines, powerful electro-magnets, rare-earth magnets etc. Caveat Emptor: Beware of cheap (or expensive) imitations! As the price of Gibeon has gone up over the past few years, there appears to be a disconcerting trend of some individuals offering the Rust-Prone 'Muonionalusta' meteorites as stable "Gibeon" meteorites. Muonionalusta meteorites looks superficially similar to Gibeon when cut and etched, however, in our experience they tend to be much more prone to rusting, much more common and much, much cheaper. Muonionalusta is what we refer to as a "Ruster" meteorite. When made into jewelry, Muonionalusta is often so unstable that it needs to be plated with some precious metal to temporarily keep it from rusting away. We were recently contacted by a Chinese jewelry manufacturer looking to buy large quantities of Muonionalusta meteorites for use in jewelry and for resale. We informed them that muonionalusta was not suitable for jewelry but that didn't phase them a bit. They said that they needed up to one ton of muonionalusta per year! They sent us a photo showing an example of their meteorite jewelry (which appeared to us to be plated). When we looked them up online, they were selling what appeared to be the exact same product as "Gibeon" meteorite jewelry! Who knows how much fake "Gibeon" has been sold to unsuspecting buyers. In the past several months we have observed several very well known professional meteorite dealers selling Muonionalusta as "Gibeon". When we pointed out their error they corrected their listings, however this serves to highlight the importance of buying your meteorite jewelry from someone that knows the difference between the rust prone Muonionalusta and the Stable Gibeon meteorites. If professional meteorite dealers can confuse the two, how is a jeweler, who is totally inexperienced in meteorite identification going to be able to guarantee that you are getting real Gibeon meteorite in your jewelry? Unlike many, we are experienced professional meteorite dealers. We can distinguish between Muonionalusta and Gibeon meteorites and since we cut and prepare all of the meteorites used in our Seamless line of meteorite rings, we know exactly what kind of meteorite our rings are made of, and we Guarantee their authenticity. Less experienced individuals can easily be fooled by the superficially similar appearance of Muonionalusta to Gibeon, and given the large quantities of muonionalusta being sold as Gibeon these days, it is even more important to purchase your expensive meteorite jewelry from meteorite experts. Buyer beware!